Britain's Chris Froome will start Sunday's final day of the Tour de Romandie as favourite after finishing stage four just a second behind overall leader Simon Spilak of Slovenia. 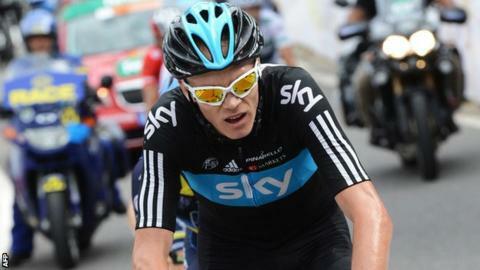 The defending champion was ushered to the finish in Fribourg, Switzerland, by fellow Team Sky riders. He now has the narrowest of deficits to overturn on the fifth and final stage's 18.5km time trial around Neuchatel. Stage four was the third won by Swiss breakaway rider Michael Albasini. Froome, the 2013 Tour de France winner is making his competitive return this week after recent illness and injury problems. 1. Michael Albasini (Switzerland / Orica) 4:14:21"
4. Davide Appollonio (Italy / AG2R) +9"
5. Anthony Roux (France / FDJ.fr) +9"
16. Chris Froome (Britain / Team Sky) +9"
1. Simon Spilak, Slovakia, Team Katusha, 15hrs, 53mins, 55 secs. 2. Chris Froome, Britain, Team Sky +1"
3. Rui Costa, Portugal, Lampre-Merida +1:02"
4. Vincenzo Nibali, Italy, Astana +1:06"
5. Mathias Frank, Switzerland, IAM Cycling +1:10"